Free Printable Guitar Scales - 14 most Commonly Used Scales. Free printable Guitar Scales and Modes. Take time to learn a bit of the language of music. Each scale has its own personality and sound. Play around with each one and make good friends with the ones you get along with. You don't have to use them all. For each type of music uses different scales and modes. Learn which ones to use for your favorite music and make it yours. Free Printable Guitar Scales, Ready to Download and use. 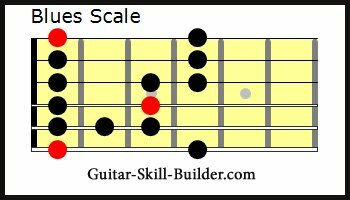 Click here to Download this Free Printable Guitar Scales Chart PDF to your computer. The Major scale is used as the basic starting point for many scales and modes. Just switching the notes around gives it another sound and feel. The Major guitar scale has a upbeat happy sound to it. It is used in quite a few types of music including: Rock Country and a few other style. It all changes when you change the underlying chords and rhythm. Link to free printable guitar scales PDF file with all 5 positions of the Major Scale. Link to Guitar Pro File of the Major Scale. The Dorian mode has a jazzy sound on guitar. Link to page dedicated to the Dorian Mode Scale. Link to PDF with all 5 positions of the Dorian Mode Scale. Link to Guitar Pro File of Tab and notation for the Dorian Mode Scale. The Phyrgian Mode has a Spanish sound to it. Very nice mode to play around with and allot of fun. Very impressive sounding. Give it a go. 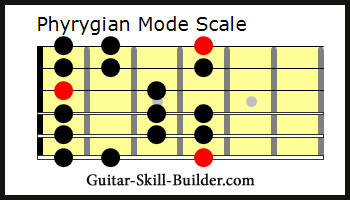 Link to page dedicated to Phyrgian Mode Scale. Link to PDF file with all 5 positions of the Phyrgian Mode Scale. Link to Guitar Pro file of tab for the Phyrgian Mode Scale. The Lydian mode has a unique sound to it. Some call it an airy sound. I like to turn up the reverb for this one. 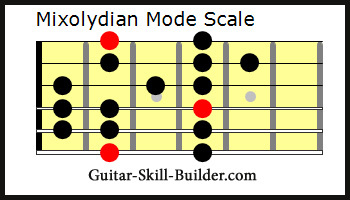 Link to page dedicated to Guitar Lydian Mode Scale. 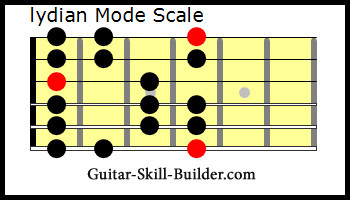 Link to free printable guitar scales PDF file with all 5 positions of the Guitar Lydian Mode Scale. 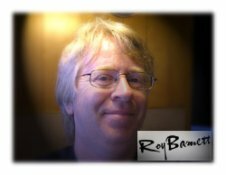 Link to Guitar Pro file of tab for the Guitar Lydian Mode Scale. The Mixolydian mode has a blues feel to it. Good for rock, country and rockabilly. The Melodic Minor scale is what I think of when I think jazz. Very much what I would expect from some very good sounding Jazz Cats. Link to Guitar Pro file of tab for the Guitar Melodic Minor Scale﻿. The Whole tone scale is a harsh sounding dissonant scale. Kind of like Limburger cheese for the ears. 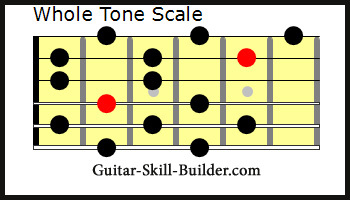 Link to PDF file with all 5 positions of the Guitar Whole Tone Scale. Link to Guitar Pro file of tab for the Guitar Whole Tone Scale. The Diminished scale would be good for Heavy Metal. Kind of reminds me of a Rat scurrying around a torture chamber. 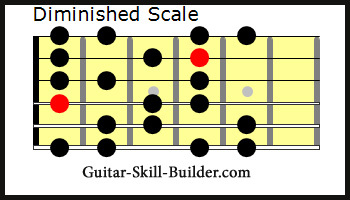 Link to page dedicated to The Guitar Diminished Scale. Link to free printable guitar scales PDF file with all 5 positions of The Guitar Diminished Scale. Link to Guitar Pro file of tab for The Guitar Diminished Scale. The Guitar Major Pentatonic scale has a bright sound that is just right for country music. It just works. Link to page dedicated to The Guitar Major Pentatonic Scale. 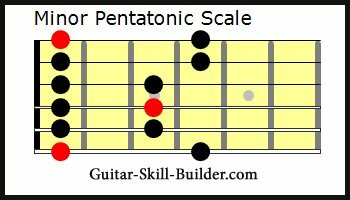 Link to PDF file with all 5 positions of The Guitar Major Pentatonic Scale. Link to Guitar Pro file of tab for The Guitar Major Pentatonic Scale. Link to page dedicated to the Guitar Minor Pentatonic scale. 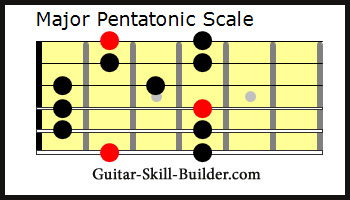 Link to PDF file with all 5 positions of theGuitar Minor Pentatonic scale. Link to Guitar Pro file of tab for Guitar Minor Pentatonic scale. The Minor Pentatonic Scale is Bluesy. Just right for Blues and Rock. Add some distortion, reverb and delay and you will be transported to that world. The Locrian mode has a sinister sound to it. Good for heavy metal and background music for a monster showing up in your movie. Link to page dedicated to The Guitar Locrian Mode Scale. Link to free printable guitar scales PDF file with all 5 positions of The Guitar Locrian Mode Scale. 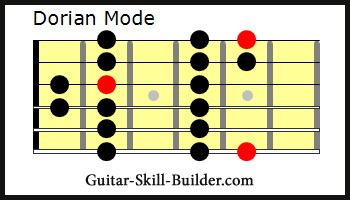 Link to Guitar Pro file of tab for The Guitar Locrian Mode Scale. 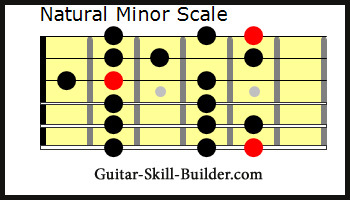 The Natural Minor Scale is a sad sounding scale. Not too sad kinda like kicking rocks on a boring day. 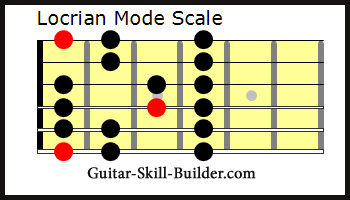 Link to page dedicated to The Guitar Aeolian Mode Scale - Natural Minor Scale. 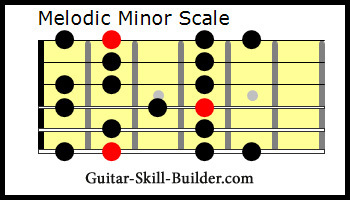 Link to PDF file with all 5 positions of The Guitar Aeolian Mode Scale - Natural Minor Scale. Link to Guitar Pro file of tab for the The Guitar Aeolian Mode Scale - Natural Minor Scale. The Guitar Harmonic Minor Scale sounds somewhat classical and sinister to me all at the same time. Good for classical rock and heavy metal music. 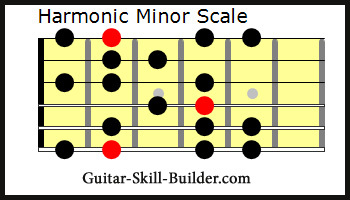 Link to page dedicated to The Guitar Harmonic Minor Scale. Link to free printable guitar scales PDF file with all 5 positions of The Guitar Harmonic Minor Scale. Link to Guitar Pro file of tab for The Guitar Harmonic Minor Scale. The Minor Blues Scale is the basis of the blues. Nuff said. 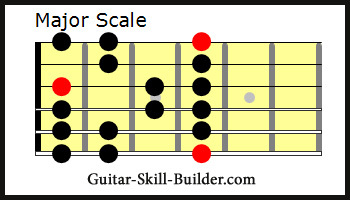 Link to page dedicated to The Guitar Minor Blues Scale. Link to PDF file with all 5 positions of The Guitar Minor Blues Scale. Link to Guitar Pro file of tab for The Guitar Minor Blues Scale.